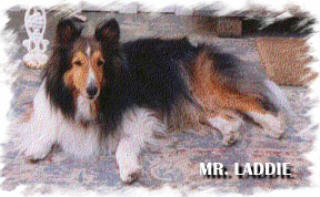 Mr. Laddie left quietly for the Rainbow Bridge about 8 P.M. February 21, 2004. His love will be with us forever. Hello. Welcome to My Page. I hope you'll stay long enough to learn a bit about me and my life, which can't really be called a "dog's life." My name is Highland Laddie, Laddie to my friends. As you can see from the photo I am a very handsome fellow, if I do say so myself -- which I do, with becoming modesty, of course. Sometimes my parents embarrass me with baby talk. They call me "Angel Baby Dog" and get all mushy and stuff but I don't mind; I know it's because they love me very much. Actually I don't consider myself a dog at all because in this house I'm really an 800-pound gorilla. 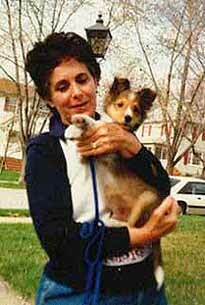 I was born in Burtonsville, MD, January 15, 1988, shortly before my Uncle Lochie went to Sheltie Heaven. I was a beautiful baby and my parents and big sister were delighted when they brought me home to Towson. I was very good and learned everything my mother taught me very quickly. Mom and my big sister Lisa thought I was just the cutest bundle of joy. But who loved me most of all?? 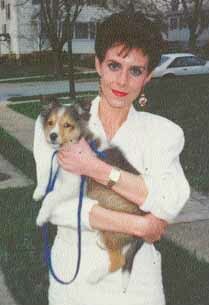 He calls me "The Sheltie God"
That's only fair I guess, considering my godlike quality of absolute love for my family. Remember, God is Dog spelled backwards! In my youth, I was quite a singer; that's right, a singer not a howler. When my Dad played the bagpipes, particularly my favorite tune, Heilan Laddie (which is my full name) I "sang along." I'm much older now, however, and my voice is gone. So much for my singing career. 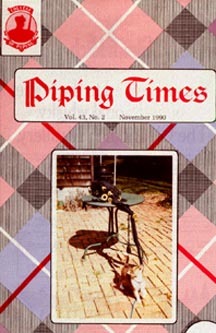 In 1990, I was a cover boy on Piping Times, published by the College of Piping, in Glasgow. My dad snapped the photo when I tried to tug his pipes off the patio table. I didn't succeed; that's good, I think. My Sheltie Relatives-And Peanuts, too. 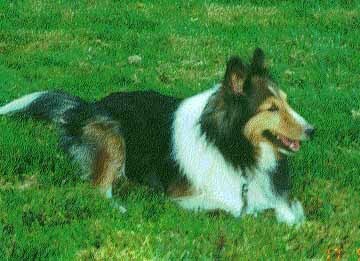 My Uncle Lochie was a Sheltie God, too, as were my other relatives, Tammy, Ginger and Mr. Winkie. At least that's the way we were treated. 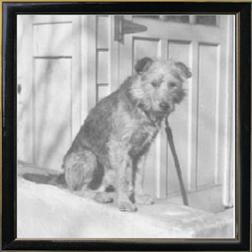 Winkie's personality demanded a "Mister," particularly when Mom and Dad took him to Brazil. All the Girls From Ipanema flirted with him and he just loved the attention. He was a splendid chap. Lochie also became a world traveler, spending four delightful years in London in the land of his forbears or for-shelties, if you will. What a wonder -- The Center of the Civilized World As We Know It -- finding a vast array of exotic smells such as he had never known before and strolls in Kensington Gardens exchanging greetings with the hoity-toity dogs being walked by the butler. Veddy posh, doncha know. Here's Uncle Lochie with Mom in London. Handsome fellow; good looks run in the family. Actually, I've done a bit of traveling myself, and even some exploring, alone. (Don't tell anyone but I'm not allowed out alone at home). Here I am crossing the vast expanse of lawn at Westview, the beautiful antebellum plantation in Virginia which my other big sister, Kathy Lee, is restoring to its C.1830 appearance. 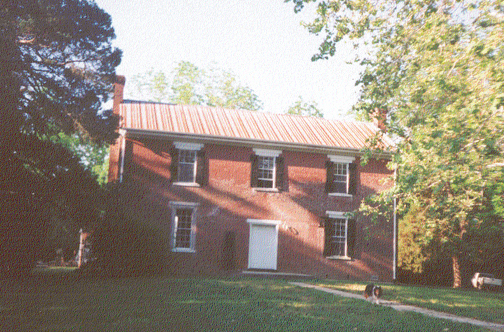 It's on the National Register of Historic Places, and it's a great place for dogs to romp. 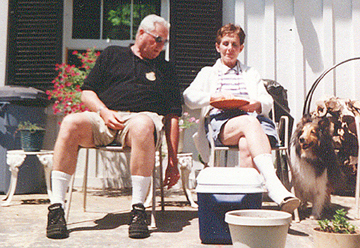 And here I am on the back veranda at Westview with Mom and Dad. I'm sure that Dad is telling me what a good boy I am. I really am, you know. 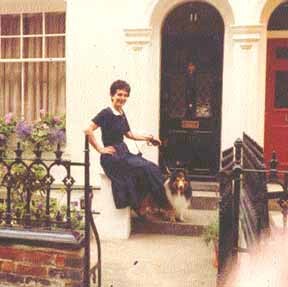 We've reached the end of my story all about me and my family and all my sheltie relatives. 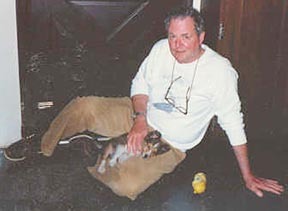 But we can't forget another wonderful dog, named Peanuts. 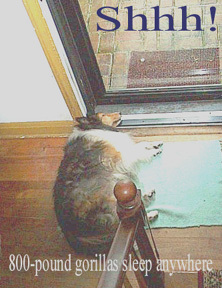 He wasn't a sheltie but he will never be forgotten. His love was as strong as ours and he'll be at the Rainbow Bridge, too. A recently discovered portrait, my first Baby Dog. "The animals are happy and content, except for one small thing: they miss someone very special to them; who had to be left behind. They all run and play together, but the day comes when one suddenly stops and looks into the distance. The bright eyes are intent; the eager body quivers. "Suddenly he begins to break away from the group, flying over the green grass, his legs carrying him faster and faster. YOU have been spotted, and when you and your special friend finally meet, you cling together in joyous reunion, never to be parted again. The happy kisses rain upon your face; your hands again caress the beloved head, and you look once more into the trusting eyes of your pet, so long gone from your life but never absent from your heart." 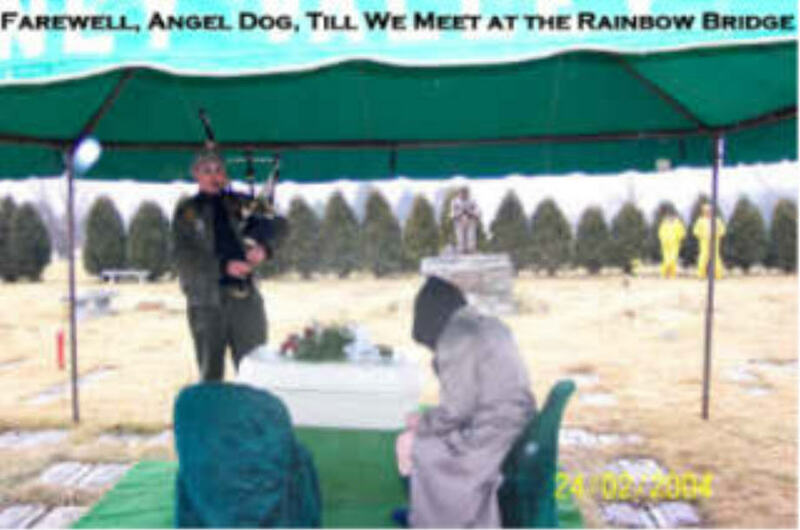 " Then you cross Rainbow Bridge together"
Thanks very much for stopping by. Please come again soon. 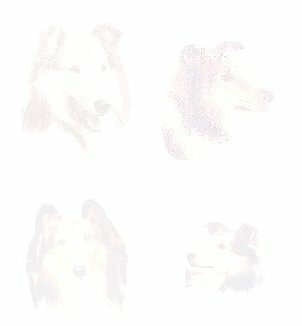 and together we chose another sheltie to brighten their lives. He's a very good boy and very handsome.